Rare letter by Mary Wortley Montagu, pioneering travel writer, up for sale. This headline comes from today’s Guardian, and refers to the only surviving correspondence from the celebrated Lady Mary Wortley Montagu in Turkey. The article can be viewed in full here. 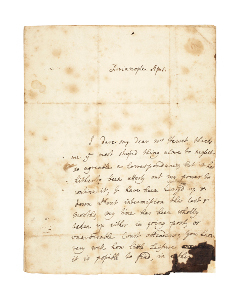 Lady Montagu’s letter is included in our new catalogue dedicated to 250 years of women travellers. We have collected presentation and association copies of well-known titles by Lady Isabel Burton, Queen Victoria, and Freya Stark together with similarly remarkable books, photograph albums, and manuscripts by lesser known figures. The authors range from dwellers in the tropics to polar explorers; from travellers on foot and horseback to those soaring through the skies and speeding along roads; and from linguists assimilating their host cultures and religions to ‘accidental adventurers’ – those women widowed, unmarried, or otherwise marginalised, who carved lives and careers out of travel writings. As Isabella Bird famously said: ‘Travellers are privileged to do the most improper things’ — and to show their readers the world through new eyes. For further information, please contact Anke Timmermann.